HARTLAND, Mich. (WXYZ) — On Christmas Day, Chuck Stoner went to see a movie at Emagine Movie Theater in Hartland when he found a money clip in the parking lot. “It just kept ringing in my head I’ve got to find this person,” Stoner said. The clip had “United States Coast Guard” written on it. “I knew it was a veteran and that — I think that’s what's been resonating more than anything over those three days was this has got to get back to that person,” he said. Stoner made a post on Facebook three days after he found the money clip. The post reading in part, “I have been keeping it in my pocket every day and can't stop thinking about the person who lost it." 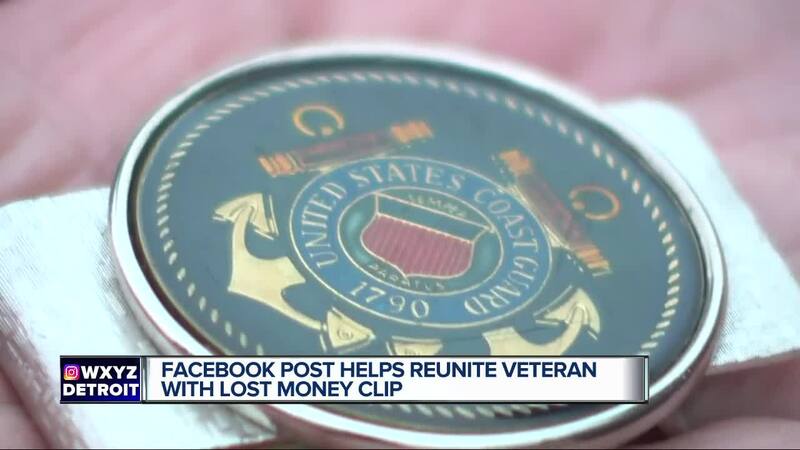 It turns out the money clip belongs to Scott Reynolds, a member of the U.S. Coast Guard from 1975-80. “I don’t care about the money — it's the money clip. It’s sentimental value, good memories,” Reynolds said. Reynolds lost the clip, along with his money, two days before Stoner found it. He thought it was gone forever, until he saw Stoner’s Facebook post. “I happened to be on Facebook and I was scrolling through and there was my money clip,” Reynolds said. The post was shared more than 22,000 times.